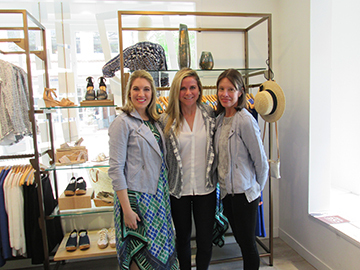 FASHION FORWARD: NIC+ZOE, the women’s boutique on Palmer Square, offers up-to-date, fun, and comfortable fashion, explains Cynthia Saffi, director of marketing. “Our clothing is made to flatter the female form. It moves with you, and it can take you from one activity to the next, from day to night.” Shown from left are store manager Sara Brosious, Cynthia Saffi, and assistant manager Jacque Keck. Fashion is fun at NIC+ZOE, the women’s shop at 73 Palmer Square West. Opened in November, it is one of eight stores owned by Dorian Lightbown, creative officer and designer. Headquartered in Massachussetts, the first store was opened in 2015, after Lightbown saw a need to update and creatively coordinate women’s wardrobes. Previously, she had established a thriving online operation. Her idea was so successful that plans to launch more stores, which are named for Nicholas and Zoe, Lightbown’s children, quickly materialized. “Style is the story behind the brand,” notes Cynthia Saffi, NIC+ZOE’s director of marketing. “Dorian had spent decades creating innovative knitwear for fashion brands before launching NIC+ZOE. As a designer and working mother, she noted an overly structured uniform of dress, that was stifling active, busy women. She saw that women needed to look professional. Princeton seemed a perfect match for NIC+ZOE’s innovative yet easy-wear fashion, and a busy online following with Princeton clients had already been established. The clientele is typically in the mid-30s and up age range, notes Cynthia Saffi. “They don’t age out of the brand. It’s generation to generation. And, all shapes and sizes can be comfortable at NIC+ZOE. Our sizes are petite to plus. And we emphasize comfort clothing. Everything is made with comfort in mind. Also, you will find fun unexpected details, such as fringe and other embellishments. Customers will find an intriguing selection of fashion for all occasions. In addition, they can complete the fashion statement with a choice of NIC+ZOE’s charming accessories. Shoes, scarves, handbags, hats, and jewelry are all attractively displayed. Indeed, focus on knitwear, fit, fabric, fashion innovation, and color are the fashion guide at NIC+ZOE. Whether it’s the best-selling Wonder Stretch Pants, the very feminine “Twirl” fit and flare silhouette dress or the casual to dressy favorite 4-way cardigan (worn tied, twisted, wrapped, or open), comfort, breathability, and effortless style are continuing priorities. Flexibility and versatility, form, and function all come together at this unique shop. Also available are sleek jeans, snug tank tops, and the popular seamed riding jacket, with a front button closure and hi-low hem line. “A figure-flattering layer that is comfortable to wear all day, from work to weekend,” notes Saffi. Blue is an important color this season, and it is in evidence in many formats and styles. In particular, a tunic-style top, featuring open-work, cut-out design is offered in a lovely shade of blue. In addition to the innovative fashion at NIC+ZOE, the shopping experience itself offers a warm and friendly aura. There is a nice feeling of space, with no sense of crowding, and very appealing displays. The fitting rooms are also spacious and welcoming, with a personality all their own, and with a key focus on the customer’s comfort. The price range is competitive, and sales and promotions are offered. In addition, a customer loyalty membership program is available in which participants can receive special offers and information. The shop is open seven days, Monday, Tuesday, Wednesday, Saturday 10 a.m. to 6 p.m., Thursday and Friday 10 to 8:30, and Sunday noon to 5. (609) 285-2754. Website: www.nicandzoe.com.